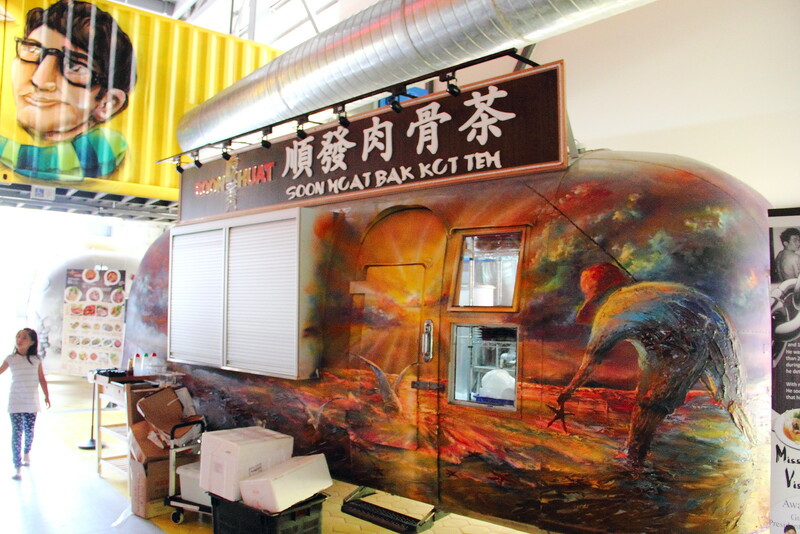 Will this be our future Hawker Centre? 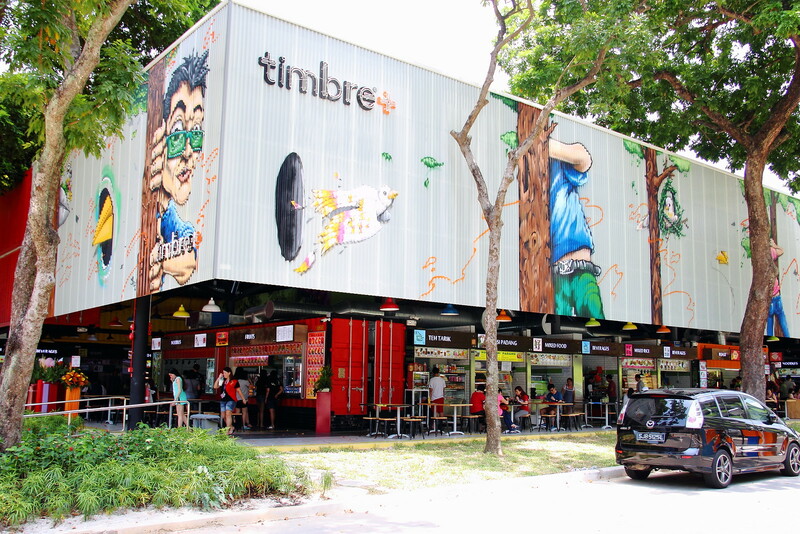 Judging from the crowd since its opening, Timbre+ seems to have got it right housing 35 different F&B brands under one roof at the latest and newest gastropark with a mix of hawkers and restaurants. 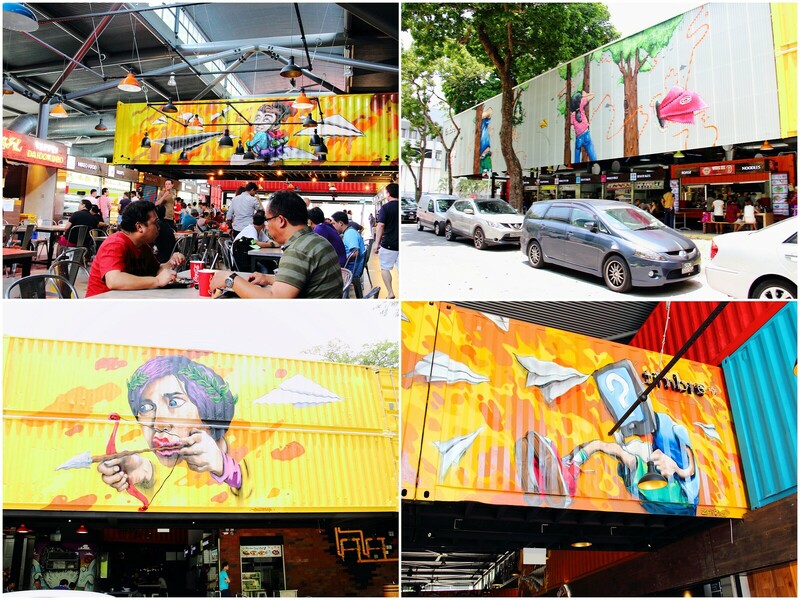 I prefer to call it the hipster hawker centre. While Timbre+ may house most of the latest F&B brands, it did not forget about the heritage of Ayer Raja Crescent. As per my best understanding, the original food stalls from the demolished Ayer Raja Crescent hawker centre which moved to a temporary tent nearby has been invited back to the latest iconic dining spot in Singapore. 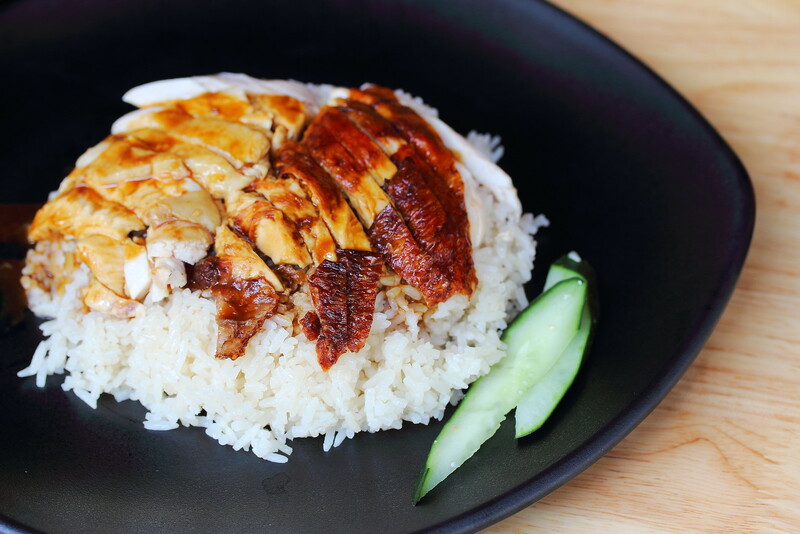 It may not be the best chicken rice in town but it definitely has its followers after all these years. 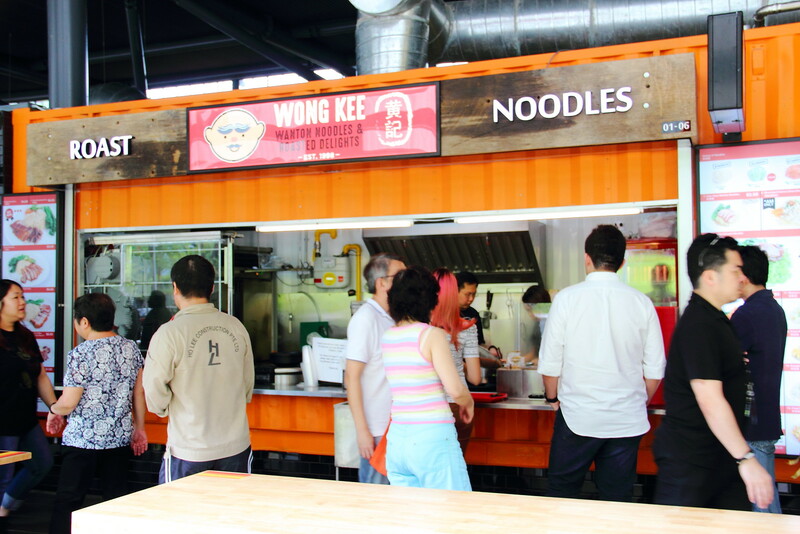 Not to be missed at Timbre+ is Wong Kee Wanton Noodles and Roasted Delights. I would recommend having their Char Siew Dumpling Tomato Noodles and Beef Brisket Spinach Noodle. 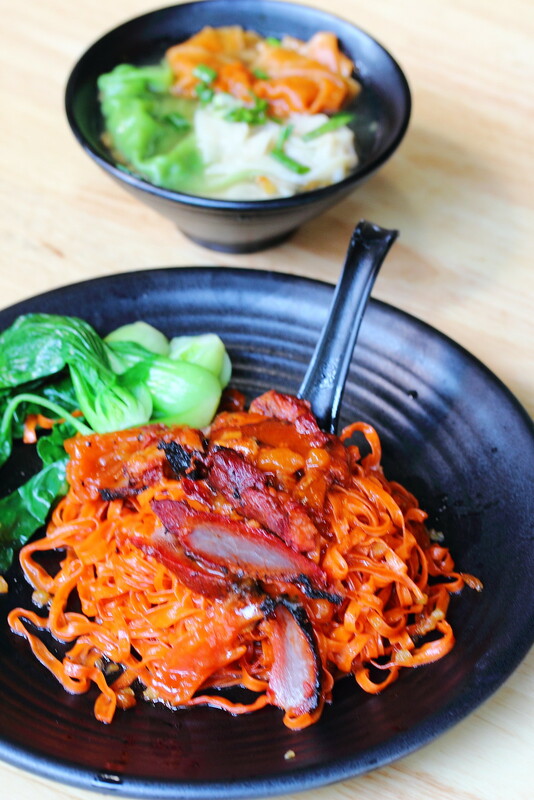 The tomato noodles has a hint of sweetness on top of the springy bite but the char siew can be better. 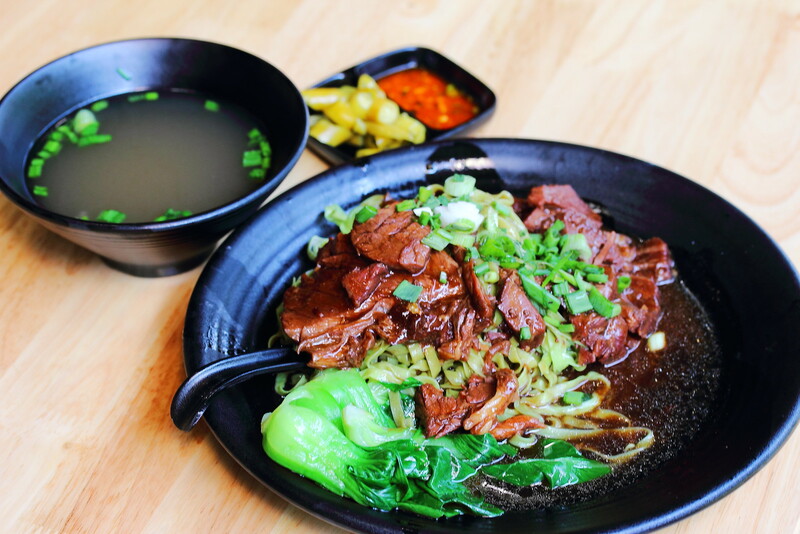 I would suggest trying the beef brisket spinach noodle. 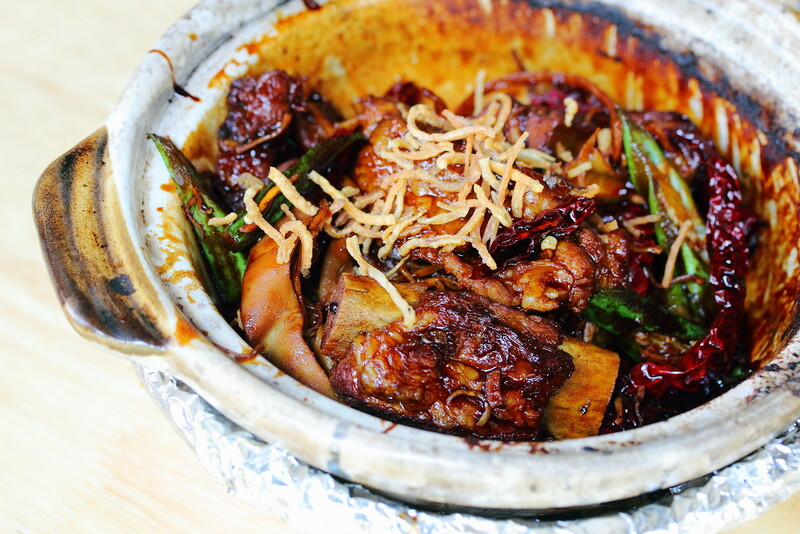 The beef brisket cooked with more then 15 different spices and stewed for hours is really flavourful and tender. The savoury sauce pairs excellently with the noodles too. Another star at the stall is the chunky dumpling that is stuffed with crunchy chestnut bits, turnip and black fungus. 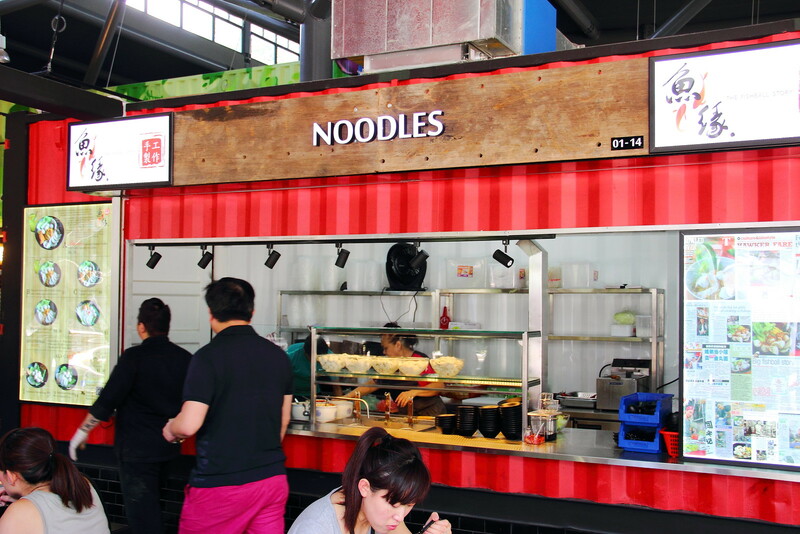 Many would ask what make the fishball noodle at Fishball Story so special? Douglas, 26 years old this year makes his fish balls and fish cakes from scratch using yellow tail fish only. His usual day starts from 4am to make the fish balls and fish cakes, even the sambal chilli and pork lard. I mean who at this age or his generation is willing to do this nowadays. 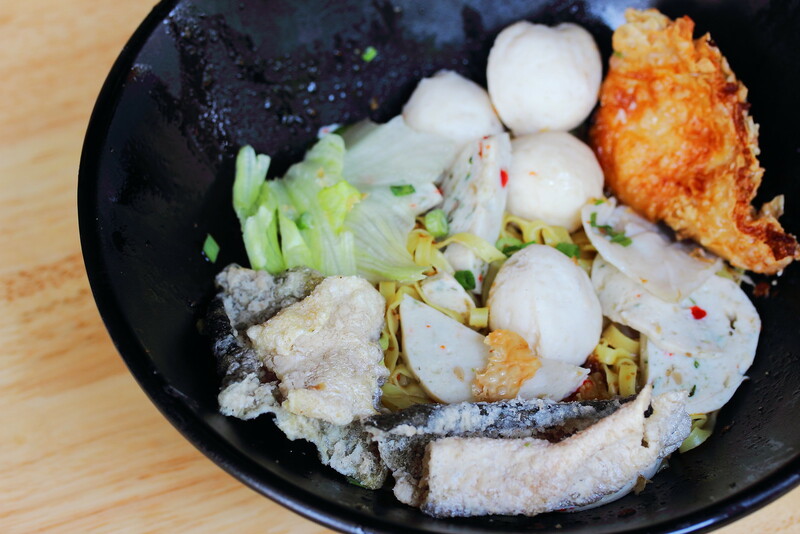 At Timbre+, the Premium Fishball Noodle ($6) comes with fish balls, fish cakes, deep fried fish cake and fish skin. Normally we will order ban mian soup for its rich and flavourful soup. At Wang Jiao Ban Mian, I would recommend trying the Dry Ban Mian ($3.30). 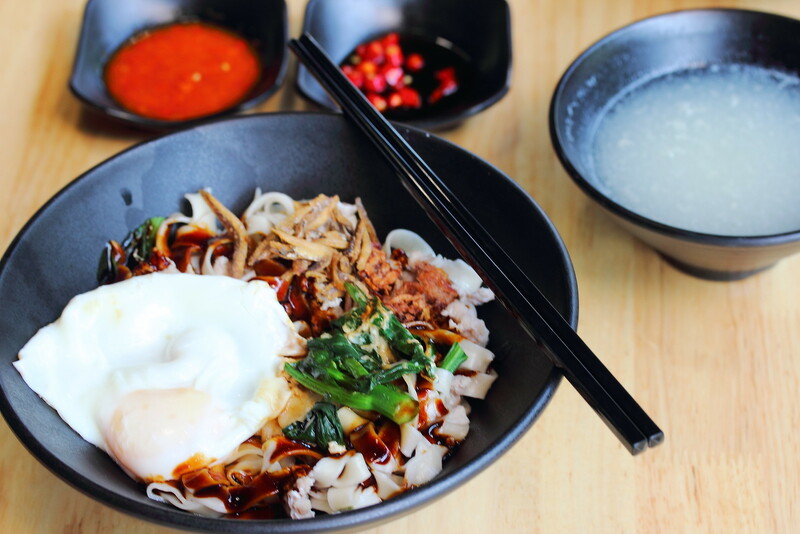 The bowl of dry ban mian comes with a perfectly cooked egg, ikan bilis and chewy homemade noodle. All these are hold together by the savoury dark sauce, bringing everything together. Sentenced to 13 years of imprisonment, Jabez Tan found a new lease of life in God. Coming up with his own Bak Kut Teh recipe, he started his F&B business in 2011 and employs mainly ex-convicts to work at the restaurant giving them a second chance in life. 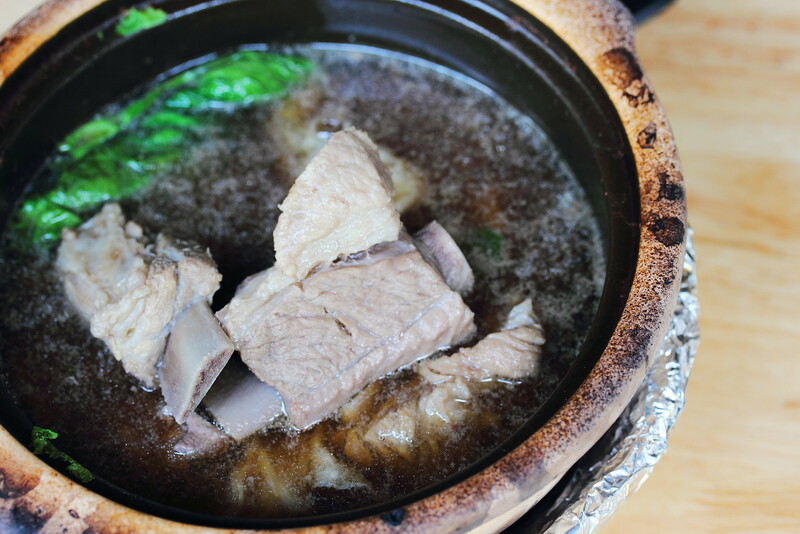 The signature item at Soon Huat Bak Kut Teh has to be there Dried Bak Kut Teh. 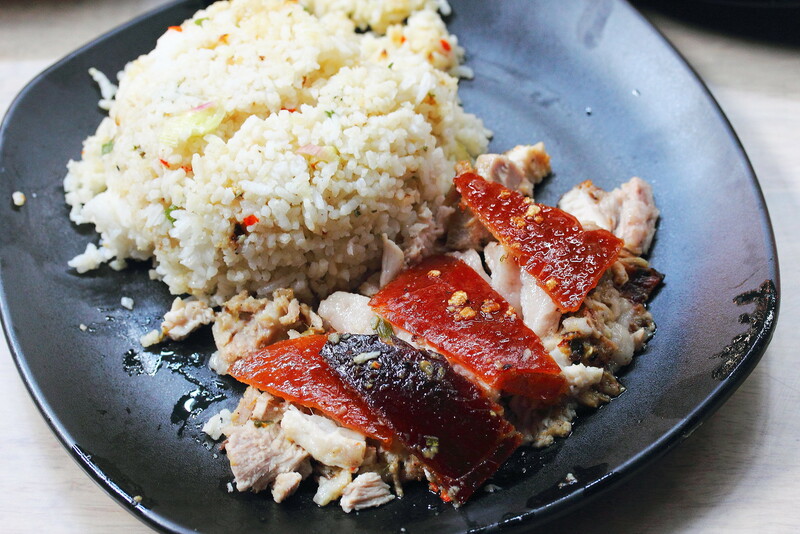 Using the same soup from the Bak Kut Teh, it was reduced in a concoction of soy sauce and oyster sauce coating the pork ribs with its sweetness while the dried chilli gives it a nice kick in spiciness. The whole enjoyment is rounded off with the aromatic topping of the fried cuttlefish. This is a must try. 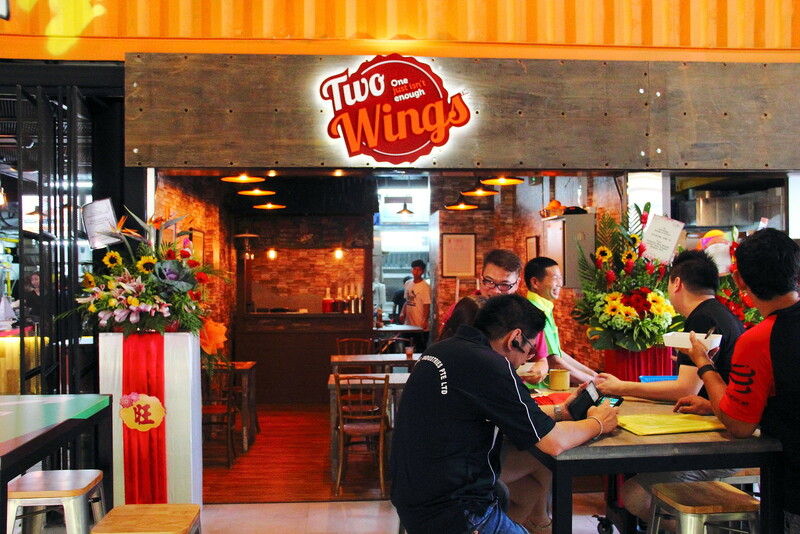 Two Wings has made a name for themselves after their first flagship outlet at Bukit Merah. At Two Wings, the wings are deep fried for nine minutes which will give them that moist and juiciness inside while crispy on the outside. Worth mentioning is the special homemade chilli sauce that is pretty potent. If you can't take spicy stuff, I advice you to skip it as it probably will numb your taste buds deterring you to enjoy the delicious wings. 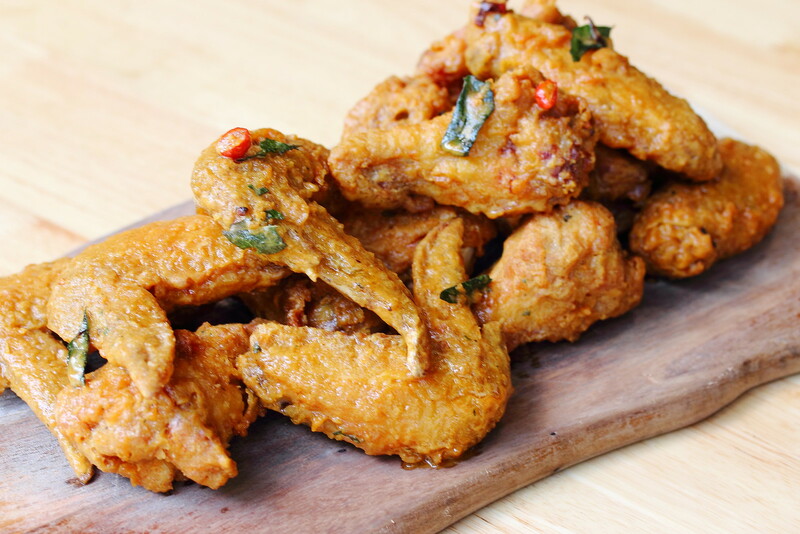 In conjunction with the opening of their third outlets at Timbre+, Two Wings launches its new flavour - Salted Egg Yolk Chicken Wings. 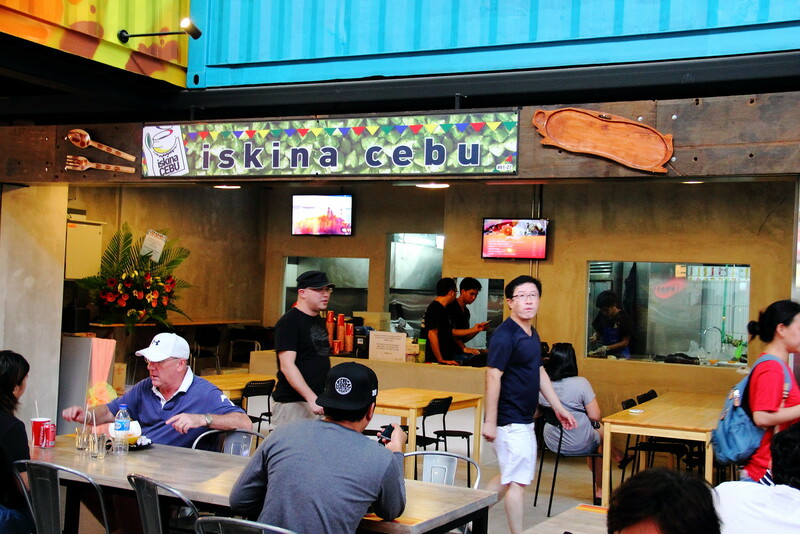 Iskina Cebu which sells the popular Lechon is opened by owner Chris. 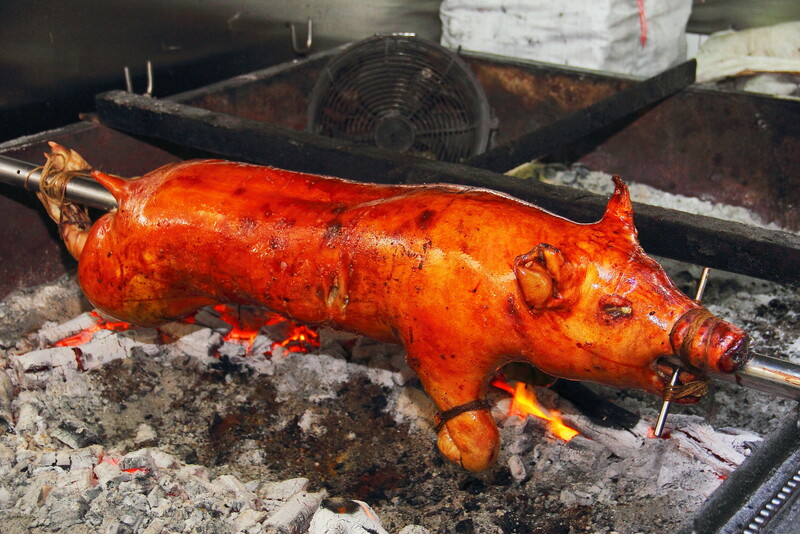 Words soon get around the island and long queues are formed each day at his Paya Lebar stall to taste the delicious Lechon (roasting the whole pig over charcoal fire) which painstaking takes about 5 hours to cook. Chris has also recently changed his supply using Spanish pig instead of Holland pig. It is understand that the quality is better and more flavourful. 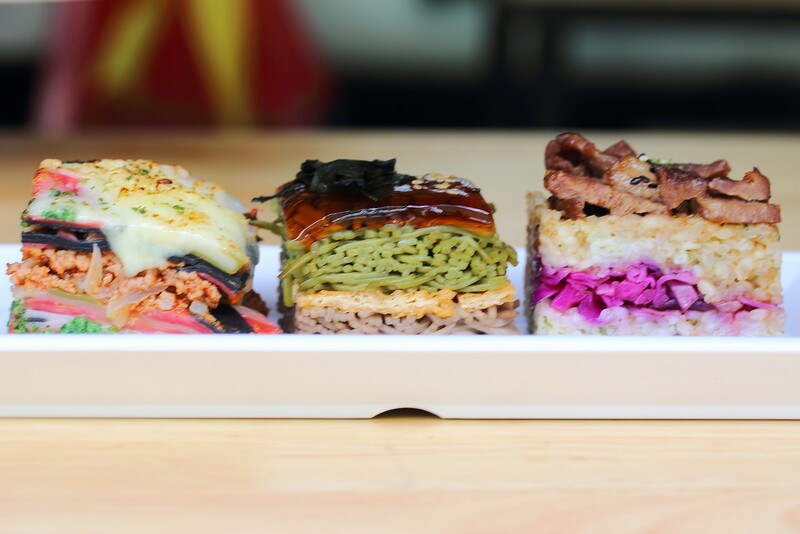 The World Is Flat is by the same folk behind Tanuki Raw, Standing Sushi Bar and Shinkasen. Offering something new in its unique pizza menu, is the deep dish pizza inspired from California. A think slide of the Fat Samurai ($9/slice, $49 whole pizza). 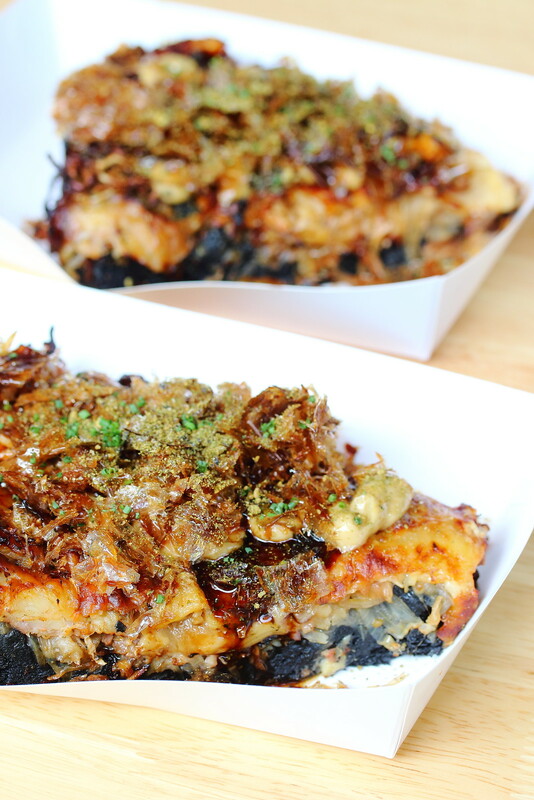 The charcoal infused doughy crust is topped with duck confit, bacon, prawn, burnt onions, smashed US beef, roasted cabbage, Konbu mayo, balsamic Okonomiyaki sauce, crispy bonito flakes, mozzarella and brie. It is really rich and heavy in flavour. 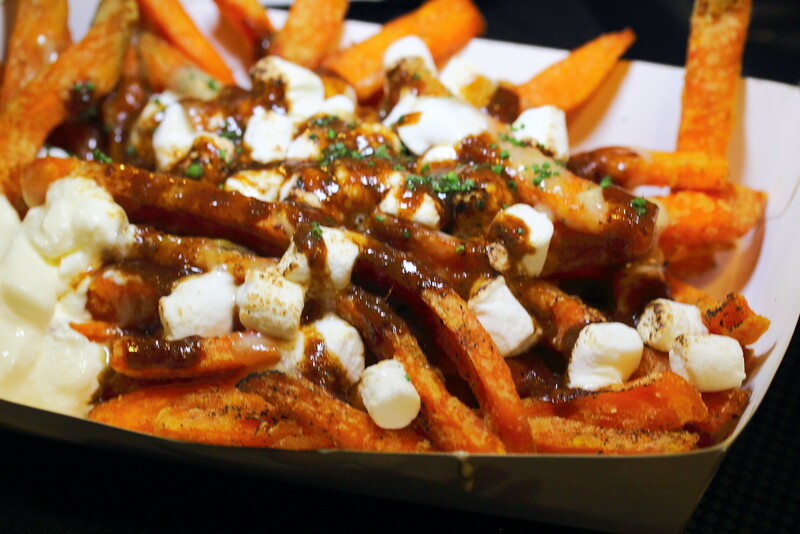 For some light bites, you may like to try the interesting Marshmallow Sweet Potato Fries. The most instagram food has to be from the Food Anatomy. The so called stacked food comes in a variety of combination. Each meal is $16 which comes with a choice of 3 different stacked food. We tried the Cold Soba, Organic Lasagna and Pork Cheek with Fragrant Rice. The cold soba is our favourite with the creative de-constructed cold soba idea. 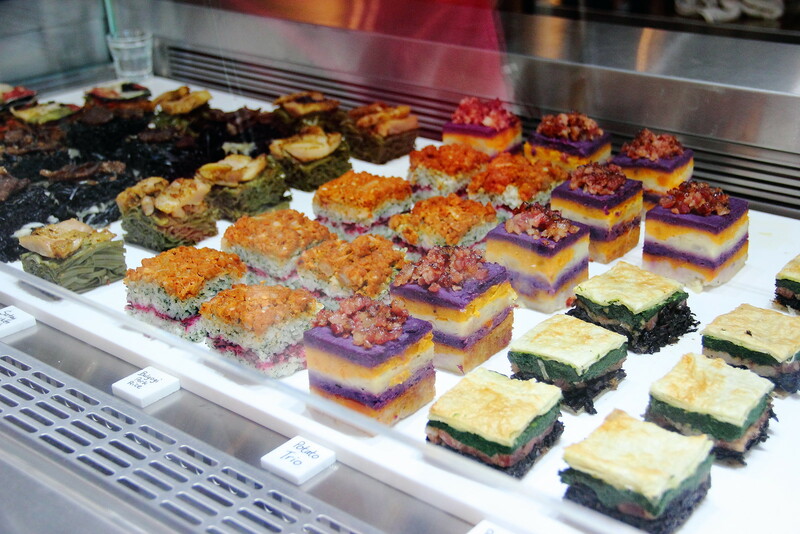 Pretty in presentation but I think the stall overlook the fact that it is very hard to handle and eat the dishes. I have long heard about Chef Damian D'Silva's culinary skill but I never get to try it until my recent visit to Timbre+. 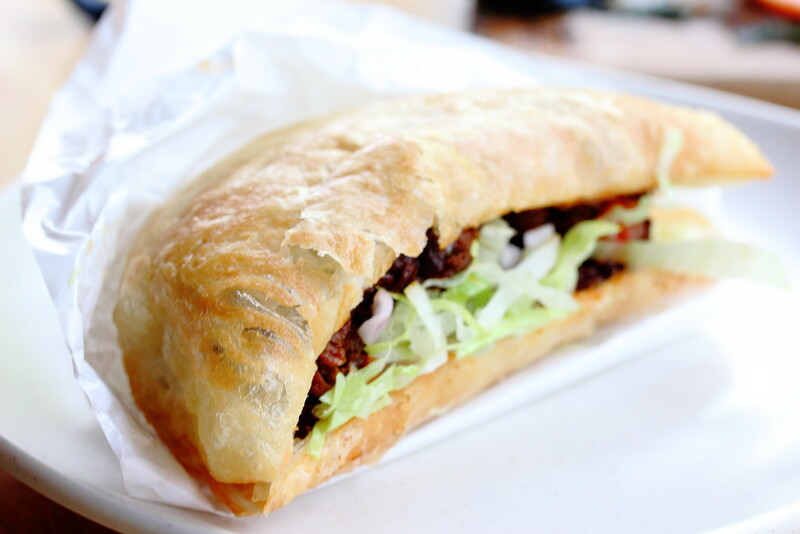 D's Joint is Chef Damian's later concept serving up some surprises such as the Lim Peh Slider. 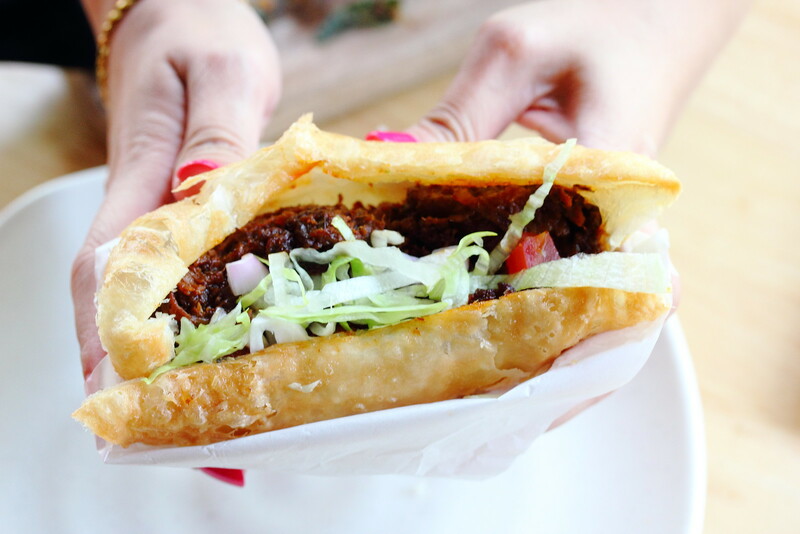 I had a bite of the pastry, stuffed with the aromatic rendang and I could not stop eating. This is a must try. Teppei Daidokoro is the latest Japanese yakitori concept of Chef Teppei Yamashita. 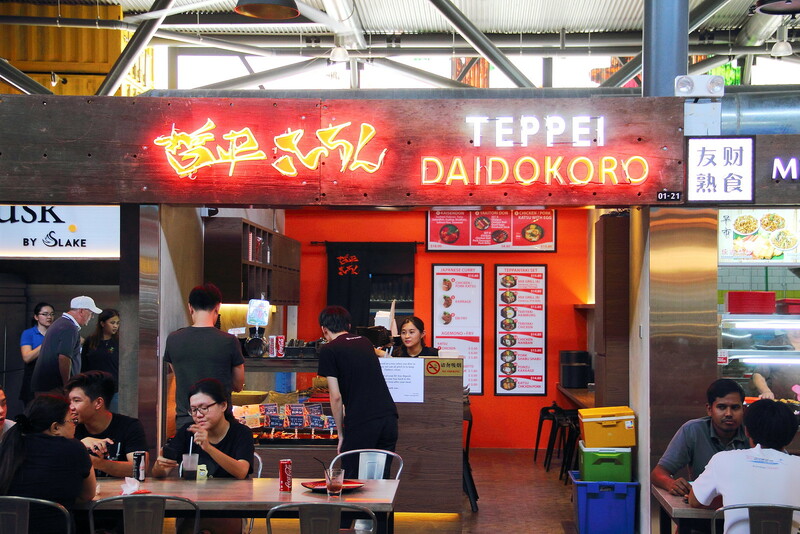 Teppei Daidoroko (“Daidokoro” means “kitchen” in Japanese) brings Chef Teppei’s characteristic high quality and reasonably-priced Japanese food with a focus on yakitori (Japanese skewers) into Timbre+. 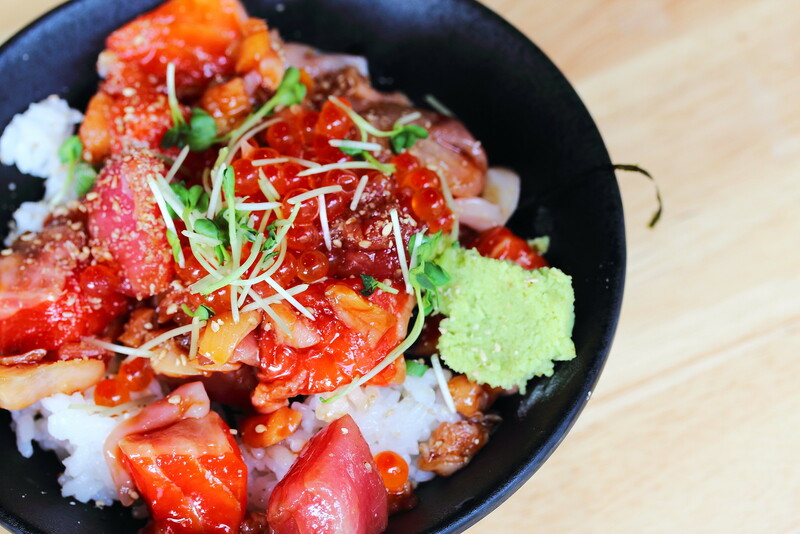 In addition, Teppei fans can also enjoy the signature Kaisen Don $16 (sashimi rice bowl), grilled/deep-fried breaded bentos/dons and Hokkaido croquettes. The Bottle Shop has a rotating beer and cider menu of close to 200 different types. 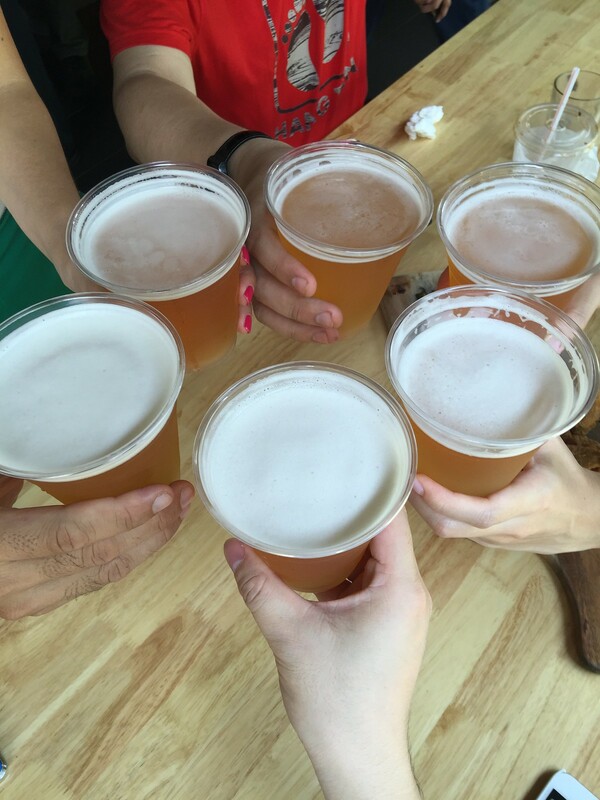 At any one time you visit the Bottle Shop, there are at least 100 beers and ciders for you to choose from to go with the variety of food at Timbre+. 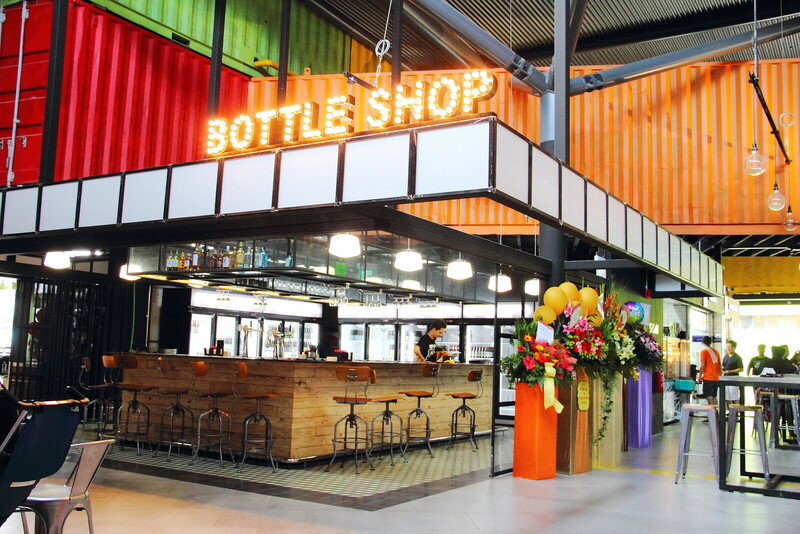 For the not-so-beer-nerds, the Bottle Shop also offers a limited range of spirits and wines. Besides the good food and drinks at Timbre+, it also introduces the first ever tray return initiative. All the trays are mirco-chipped. When you order your food and you required a tray, a dollar is charged to your total bill. When you return the tray at the centralized collection location, the system will return a dollar back to you. I find this a good initiative since the current campaign at hawker centres does not work. At least I am not seeing dirty plates lying around , stacking up and even birds eating the left over food.